Anxiety is an awful beast that comes in and steals your happy child and turns him or her into a miserable, frustrated animal. 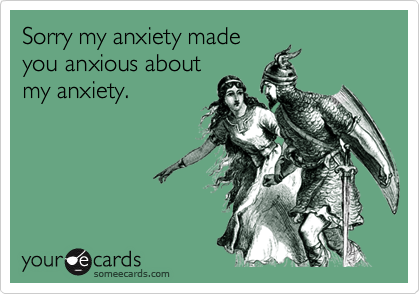 We were dealing with anxiety before we even had a name for it. And I noticed something: your child’s anxiety has a way of becoming contagious to the entire family. It can be 15 minutes before he arrives home, and your stomach is aflutter wondering how his day was at school. If he tries to relay a tidbit about his day, and you are unable to understand his words due to the severity of his speech impairment, everyone’s anxiety begins to spiral. Out. Of. Control. Aaaaaaaaauuuuuugggggghhhhhhhhh….. When my daughter was two years old, I would see the look on her face when her brother started “circling the drain” as we called it, right before an anxiety-triggered meltdown. There are behavioral approaches to anxiety: We used social stories, PECS and other AAC means, positive reinforcers, etc. School rarely saw the anxiety because school was predictable. But the most notable change in his ability to cope with everyday life occurred after we did his first metabolic analysis. His methylation cycle was completely shut down. In the most basic terms, the methylation cycle is responsible for the transport of all nutrients to the cells of the body, as well as the transport of the waste. The first time you Google “methylation cycle” your heart may sink. It is complex — but don’t give up! Here is a basic description of the methylation cycle . Also, Dr. Amy Yasko has many helpful videos, diagrams and articles about methylation on her website. Here is a good starting point. I won’t pretend we figured this all out by ourselves. In the beginning, we had the help of a talented DAN! doctor who loves research and was a neurologist for over 30 years. He walked us through our metabolic analysis and pinpointed the areas in which our son’s methylation cycle was breaking down or backing up – much like a sewage pipe. We added supplements based on that and retested three months later. Then we made a course correction based on those results. Over the years we have stepped away from the labs to determine which supplements to add — not because they are not helpful, but because we have to use our money wisely. Those first few years were definitely helpful because they gave us a baseline of what was happening in our son’s body. If you are looking for a clinician to help you in treating your child, the Autism Research Institute has a few guidelines to help . Autism Today also has a partial list of practitioners helping families. I really like ARI’s suggestion of getting referrals from other parents. In the internet age, it’s a much easier task, and information on different providers is plentiful. Here is a list of some anxiety-reducing supplements, herbs and other modalities. If you are looking for answers, research these supplements, and talk to your practitioners. What works for one person, doesn’t always work for everyone across the board. 5-mthf: the most bioavailable version of folic acid. Forty percent of Caucasians cannot process folic acid. This presents a big back up in the methylation cycle. We first added folinic acid and it did nothing. We had to add this most broken down version of folic acid to see any results. Researchers are finding that patients with intractable depression and anxiety, who do not respond to meds, are helped significantly by 5-mthf. GABA (gamma-aminobutyric acid): an amino acid. It is the main inhibitory (calming) neurotransmitter in the brain. Neurotransmitters are chemical messengers between neurons (nerve cells). Our bodies make GABA from glutamine – a vital amino acid in the brain. GABA is a natural calming and anti-epileptic agent. It is vital for proper brain functioning. GABA also helps our bodies make endorphins – chemicals that make us feel happy. See more here. B-complex: Generally, a good B-complex is good to have on board, especially if you are having issues with anxiety. Magnesium: a mineral that has a great calming effect. Most autism multivitamins will contain a significant amount of magnesium for this reason. We always had a lot of magnesium on board due to constipation. Herbs: There are natural herbs including valerian, passionflower and kava. Do your research, talk with others using naturals and see what might work best for you. Personally, we never used much in the way of herbals. 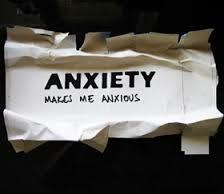 Homeopathy: There are several remedies that target anxiety. For us, personally, homeopathy has been a game changer. Over time, we were able to drop meds and supplements from our daily lives and hold onto the gains, and go even further with physical, cognitive and emotionally development. I encourage you to find a competent practitioner to guide you through homeopathy, though. It’s worth it. Energy work: Savage posted a blog a while back about Emotional Freedom Technique (EFT) This type of energy work helps the body use it’s own mechanisms to reduce and release stress. I can’t imagine doing this on my son, but I will tell you that it is something simple that you, as a caregiver to someone with a chronic illness, can do to help reduce your stress level. It takes ten minutes. Ten. You are worth it. Which brings me to my next point. Remember how I started out by saying anxiety was contagious? It is, and our kids can catch it from us. As we run around like mad men trying to get every “i” dotted and “t” crossed, stress is oozing from our bodies. Some days are worse than others – especially the days where there isn’t enough — time or money or sleep (especially sleep). It is not a luxury to take care of yourself. It’s one of your jobs. Stress kills. 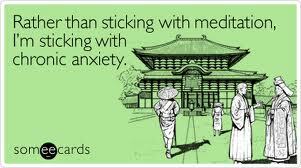 You have ten minutes a day to meditate or do your EFT tapping. Even if it is as you fall asleep in bed. This is just the tip of the iceberg, folks. Let’s join forces and share anxiety reducing success stories for our kids and ourselves. Together we can make the real difference. This entry was posted in LuvBug TMR, Taking Care of Yourself. Bookmark the permalink. My 12 year old is on Prozac for anxiety and OCD. I’m not sure it’s working and I’m frustrated. We started using oils and I feel they are helping some, but can’t say for sure. I want to help my daughter, but I’m lost at what to do next. There’s so much information on the web and I don’t know where to turn. I’m anxious now myself! HELP! Where do I start???? For anyone in similar situations, what helped? Will your child take supplements? As a first line, I found that using Andy Cutler’s anxiety supplements made a big dent for my daughter on a daily basis. http://onibasu.com/archives/am/195792.html Fish oils helped as well. Personally, if I had it to do over again, I would try to teach her EFT as described in the book The Tapping Solution by Nick Ortner. It’s a great tool for taking charge of your own outlook. My friend and colleague Julie Matthews (www.nourishinghope.com) shared this blog with me and I’d love to share some of my thoughts. I also find that many kids do so well on tryptophan which helps with worry in the head, rumination and also depression and sleep problems (and of course carb cravings) – moms too of course – gotta take care of all the moms! How did you know I needed this today?? Anxiety at an all time high here, need to try something and I will try anything but Pharma drugs. Thanks so much! I am a MAPS physcian and i think the list of suggestions is excellent! its really hard for me to pinpoint how to help because i don’t have a history or lab tests, but in my experience anxiety is controllable. Richard Frye, M.D. PhD has done excellent work on the mitochondria. The tests are covered by insurance. There is a solution…Never give up never give in! THANK YOU!!! THANK YOU!!!!! LOVE THIS ARTICLE!!!! PRINTING AND POSTING ON REFRIGERATOR! WORK DESK! SCREENSAVER!!!! 🙂 Gotta love your enthusiasm. Thank you, thank you, thank you for this post!!! We have been battling anxiety for several years now, but it came to a head last summer when we finally tried adhd meds. The anxiety was terrible! We have him on zoloft right now, just to take the edge off. It took his primary two years to convince us to try it, but I wasn’t sure what else to try. Thank you for the links to get me started!!! Also, I’d like to add that global anxiety could be caused by a retained infant reflex. Specifically the moro reflex. We have seen a significant reduction in anxiety after working on integrating primitive reflexes.